Barrel: 4.1 inches, metal non-rifled. Propulsion: CO2 x1 (12 gram). Trigger Pull: The trigger pull on the Crosman PRO77 is good and light as it should be for a single action only airgun. I did find it to be a bit creepy when the magazine is loaded but on an unloaded magazine it is smooth as silk. There must be something going on with the chambering of BB's. Accuracy: I found the Crosman PRO77 to be a decent shooter, getting about a 2 inch grouping from 20 feet out standing in a free standing position. After my test grouping I shot another 2 magazines into the target in a more rushed shooting style and the pattern did not grow much larger than the original 2 inches. I also put 8 rounds through my Chrony Chronograph and the PRO77 averaged a respectable 285 fps, not too far off of the factory claim of 325 fps and keep in mind it was not a very warm day for the testing. 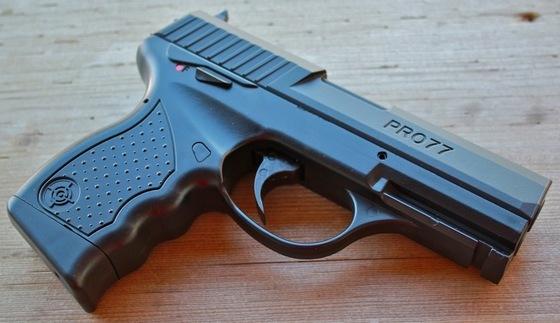 Build Quality: The Crosman PRO77 looks and feels overall like a pretty well made airgun. The slide, trigger, hammer, slide release, CO2 screw and safety are all made out of metal. The only part that could use an upgrade would be the all plastic magazine, it would have been nice to have a metal magazine for durability and a bit extra weight in the gun. The fit and paint looked good and did not show any signs of wear problems in the high point areas. Realism: The Crosman PRO77 is not a Replica gun so to speak but it does look a bit like a combination of perhaps a Sig Sauer, Steyr M9 and maybe even a little Walther P series thrown in to the pot? Crosman seems to keep well away from licensing guns for the most part. Maybe they figure they can put more money into the product and less money into other companies accounts? Available in the: Replica Airguns Store. True single action trigger with working hammer. Nice combination of FPS and accuracy. Reasonable accuracy even when shooting fast. Has an accessory rail for a laser or Tac light. CO2 and CO2 tab are nicely hidden. A bit low on fps compared to some other blowback guns. Ejection port is not cut out but molded into the slide. Magazine could have been made out of metal and not all plastic. Non-adjustable sights, kind of normal in this category.